Well, I have been thinking about tif 5 some more. This is some stuff I’m going to use. The yarn colours are the ones Pam Kellogg suggests. Then there is the pulled thread tulip and that crocheted doily. It is made from simple polyester sewing thread. Unfortunately I’m out of that special thread and the motif is nowhere near complete. The center was from a commercial source the rest was made up as I went. 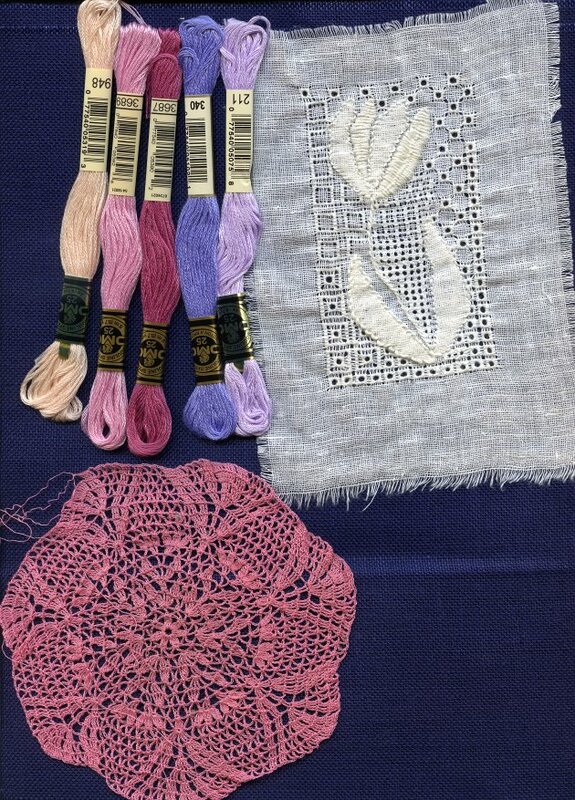 I think it was the very same thread I used for my very first lace crochet exercises after Grandma had given me an appropriate crochet hook. I started this about 5 years ago when I was lovesick. Just don’t ask, lol. I’m not sure if I will finish it using a similar thread or just use it as is. I guess this also counts as Ufo finishing/stash using. The fabric is pure linen and was horrribly expensive. I saw it at the shop where I bought the floss and fell in love. The picture will increase in size when you click it. This entry was posted on Sunday, May 11th, 2008 at 10:52 pm	and tagged with Take it Further and posted in Take it Further Challenge. You can follow any responses to this entry through the RSS 2.0 feed. I love the tulip…My husband’s last name means “tulip”, so tulips appeal to me. And I am doing a study of pulled thread right now for a project I have in mind. I’ve been catching up with your blog this morning and I’m so enjoying all your experiments. What fun it must be to play with such different materials and techniques! And you get such nice effects. Thank you suskc, and good luck with your pulled thread project. That tulip was the first time I tried pulled thread but I’ll definitely do it again. Jowynn, thank you. It is fun – so much fun that I have to be careful to finish something from time to time instead of just playing. just a random comment from a passerby who likes looking at textiles. I’ve been watching the progress on the tulip, it’s lovely and it fascinates me. Hi Diana, thanks for the compliment. This techniques is easier than it looks, try for yourself! the tulip is lovely – I like pulled thread also. Thanks, Maggie. I enjoyed reading your blog very much, good that I found it this way.What you do with pulled work is an inspiration, I like it when your pulled work backgrounds are somewhat varied, not one and the same pattern all over.